The group of interdisciplinary students; primarily made up of 30 engineering students, is responsible for the design, fundraising, construction, and competing of an FSAE vehicle. The open-wheeled race car they have designed is essentially halfway between a Go-Kart and a Formula 4 racing car and uses a 600cc engine from a Honda super bike. The FSAE competition judges a number of areas, including vehicle design, cost and manufacturing, and the vehicle’s dynamic performance. While FSAE rules dictate all team members must be students attending UBC Okanagan, the group is allowed to receive guidance from professors and industry experts. UBCO Motorsports President and fourth-year mechanical engineering student Graham Wood stresses the novelty of UBC Okanagan’s FSAE entrance. “This is the first time a team from UBC Okanagan has entered these events and having seen the event as a spectator, we know what we’re in for,” says Graham. Prior to the team’s first official FSAE competition in Lincoln, Nebraska later this year, they will be statically unveiling their car at the Knox Mountain Hillclimb, which takes place in Kelowna on May 21 and 22. The Nebraska FSAE competition takes place from June 15 to 18, and will include more than student 80 teams from across North America. 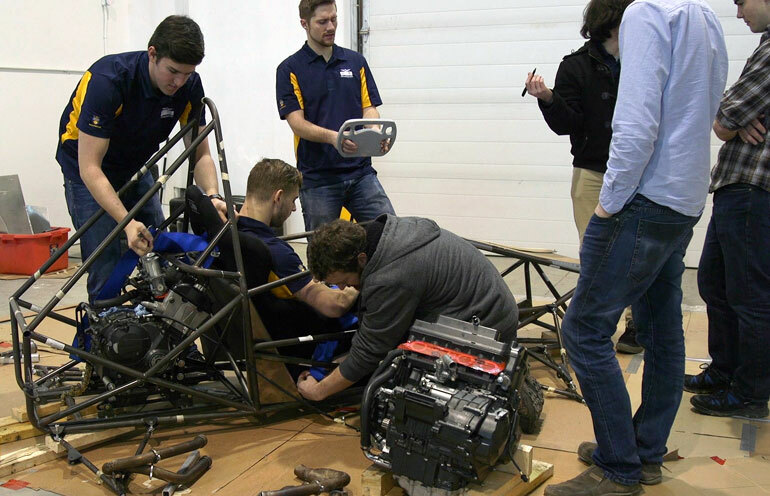 UBCO's Motorsports team prepares their car for the road ahead.